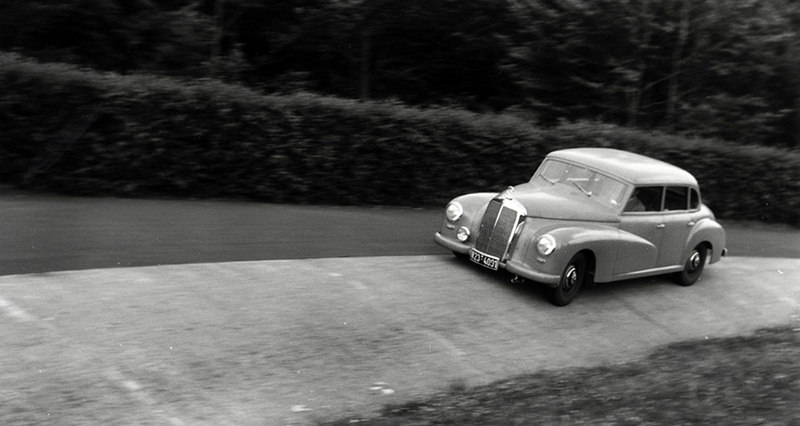 An early 300 prototype is run through its paces by Mercedes at the ultimate test facility, the Nurburgring. Note lack of chrome on windshield posts, side window surrounds, body beltline and rockers. Designated model W186, the 300 was the first new model created by Mercedes-Benz after the destruction of industrial Germany during World War II. Most of the Daimler-Benz factory was destroyed and Stuttgart was in ruins after the Allied bombing. Six years later, Mercedes-Benz unveiled the 300 series sedan and four-door cabriolet at the 1951 Paris Auto Show. Its unique appearance, advanced engineering, and luxurious appointments made it extremely popular with heads of state and other moneyed dignitaries. Mercedes-Benz 300b (W186). The 300b gained front quarterlights and the later 300c was given a larger rear window. An automatic gearbox would arrive with the 300C in late 1955. This is a RHD version. 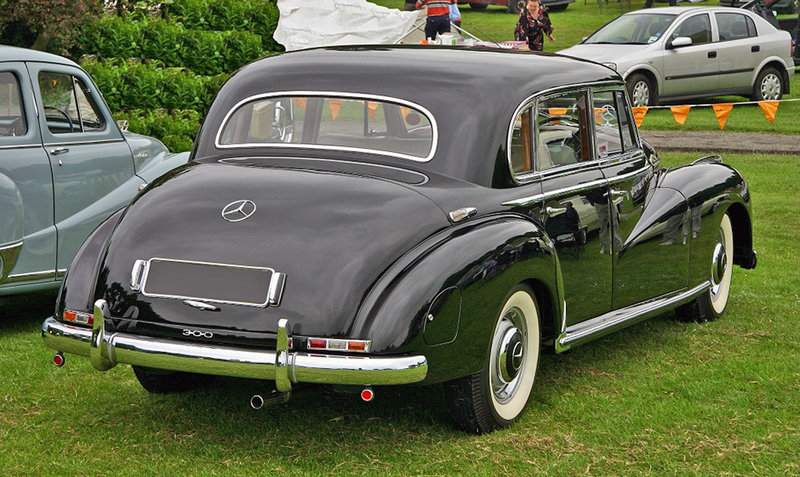 From the onset, the 1951 Mercedes-Benz 300 was aimed at the American market. The car’s outstanding quality was matched only by its breathtaking price – it cost as much as three Cadillacs. But the price ensured exclusivity, and early customers ranged from renowned architect Frank Lloyd Wright to actor Yul Brynner. From its introduction, Mercedes called it the 300, but comprehensive improvements resulted in the 300b for 1954, followed by the 300c in 1955. In 1956, a virtually brand new 300 emerged, the 300d. A completely new body was designed featuring a wheelbase four inches longer for improved ride and increased rear legroom, and swing-axle rear suspension was introduced. The 300d’s longer hood gave the car a more graceful look, while providing room for an updated version of Mercedes-Benz’s 3-liter SOHC 6-cylinder engine. Equipped with Bosch mechanical fuel injection, horsepower was increased to 180. All U.S.-delivered cars were fitted with a Borg Warner 3-speed automatic transmission. With power steering now standard, the 300d offered a much better driving experience. The 300d received revised coachwork with extended rear fenders, larger rear quarter window, and larger back window. Automatic transmission and fuel injection were standard. 3,077 were constructed from July 1958 through February 1962. The 300 was geared to the businessman and featured many luxury options including Becker radio, VHF mobile telephone, and dictation machine. Adenauer’s cars had a writing desk, sirens, curtains, and a division window. Styling remained conservative, but subtle details brought the design up to date. 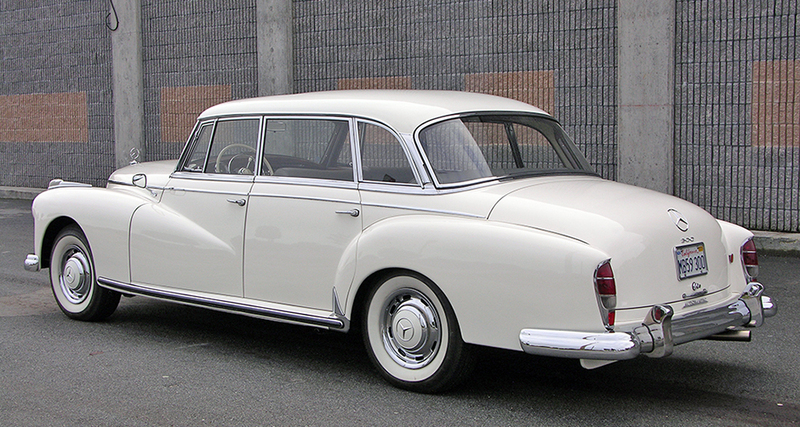 The 300s were equipped with optional white sidewalls, while power steering and Artic-Kar air conditioning were other available options as was power steering. Cabriolets were offered in late 1955 (300c) and were referred to as Cabriolet D models. 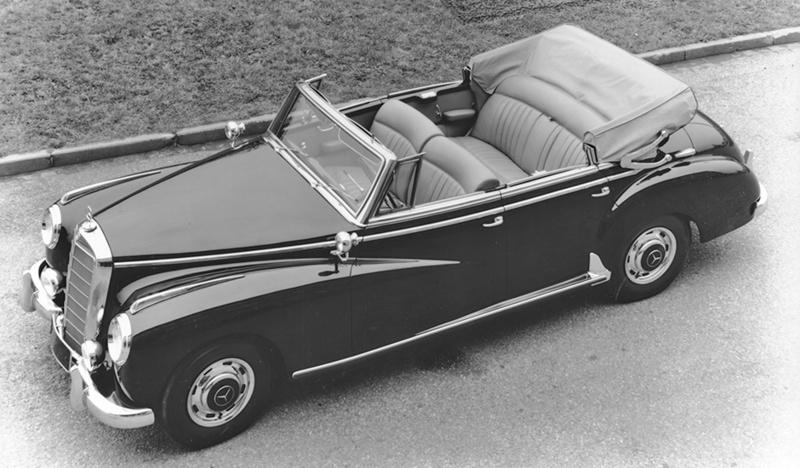 End-of-series 300d Cabriolet D was a sumptuous automobile and a favorite for diplomatic parades. Only 65 were constructed.